FTC disclosure: I received a copy of the book Possible in exchange for a fair and honest review. I also received an appreciation certificate from Family Christian for hosting this giveaway. This post contains an affiliate link to Family Christian. 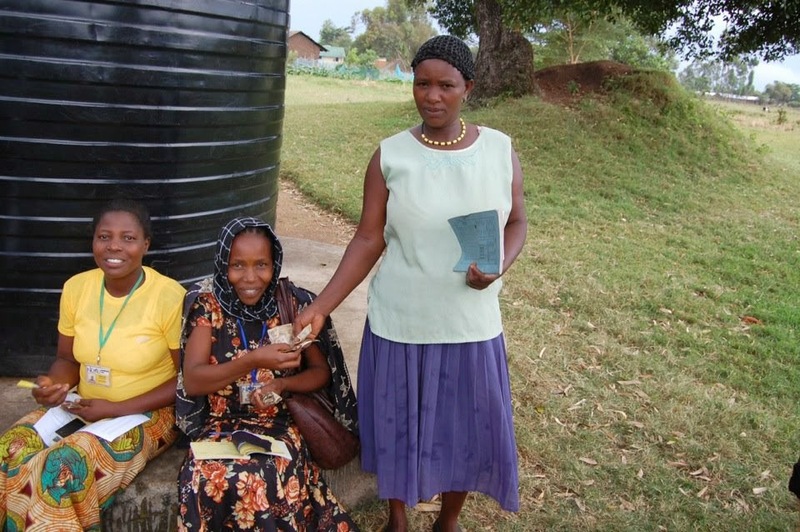 This post is merely telling some of my experiences in helping with Nuru International. Family Christian, Stephan Bauman, are in no way connected to Nuru International, although it's a great organization and I thought it appropriate to share about this organization. When I was in college, we used to sit around and dream of changing the world. I think a lot of college students do, but some friends of mine started a non-profit that has been amazing with results and as a result I feel I have a part in changing the world. Because of this when Family Christian offered the opportunity to review Possible by Stephan Bauman who is president and CEO of World Relief, I was excited because I know changing the world is possible. I do it every time I list an item for sale online. No, not impossible but Possible. When I first received this book I couldn't wait to start reading it. I knew that my friends had a new and innovative way to help include people in their fight against extreme poverty. I wanted to read more of what they knew that I didn't. This is a great book for anyone who wants to change the world, if you are on the front lines or if you work behind the scenes. Just be warned, you will come away from this book knowing it can be done, and the "It will never work" excuse will no longer fly! 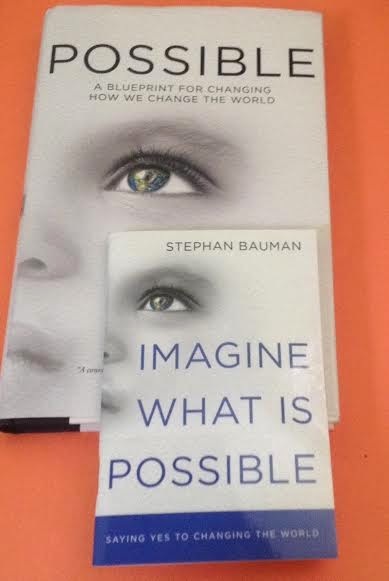 I also received a copy of Imagine What is Possible which is sold both as single copies or as 10 packs. This booklet sums up the book in one short reading. This is great for church groups to start finding their vision! One of the things I liked about this book was the author mentioned different times that bloggers have a huge influence in our world. We can help spread the word about causes and rally support. I love how he emphasizes we find our talent and use it! If we aren't talented in public speaking, that's not how we will likely change the world. I'm good at social media, getting people involved in ideas, and spreading the word about causes. I have a friend who uses her talents of crafts to raise money for missions and donate blankets and sweaters to newborns in need. She also crochets sleeping mats for the homeless. I have a talent of finding bargains, so it's not uncommon for me to walk away from a garage sale with a bag of yarn I got for almost nothing to give her to use in her projects. Unusual ways of changing the world but it is giving to others. Another lady I know loves using coupons and donates items she purchased almost free to her local food bank. In Possible, Bauman talked about finding our passion and sticking with it. In another book I read recently, it said how we are all the church and if we have a passion, we shouldn't just say to our local church, "We need to do this thing that is my passion." We are all the church, so we should follow our passion and ask the Church for help if needed. 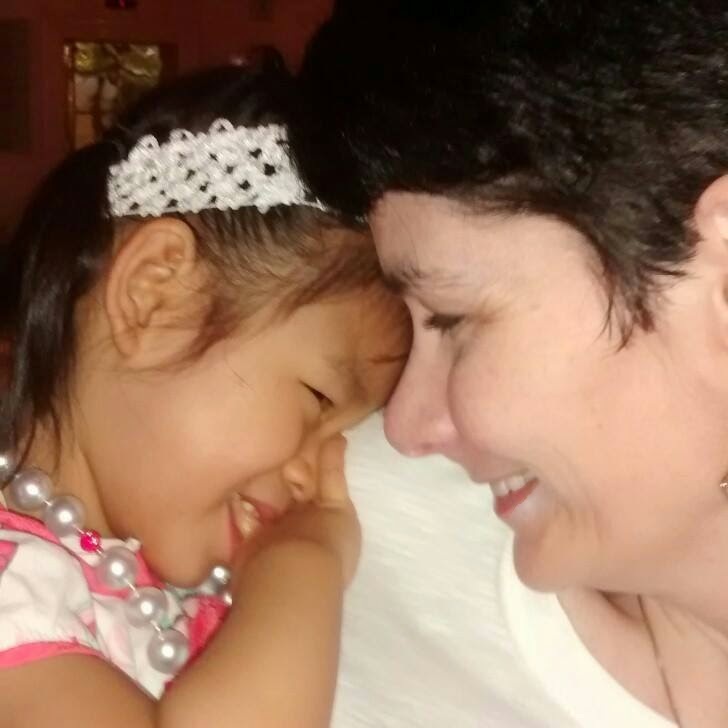 I have two dear friends from college who have found their passion in adopting special needs children from Asia. Sometimes special needs can be something as small as a cosmetic surgery. My friends have taken six children into their hearts and home. My heart has been breaking for them because they were told their daughter Ami had epilepsy, but that's not what is wrong with her. She actually has a very rare disease and is needing a major surgery that will leave her physically handicapped just so she can have quality of life. She doesn't weigh enough at the moment for surgery. Please pray for Ami. She is so loved, and she is so seriously ill, even though she doesn't look it in this photo. Ami and her mother. Photo courtesy of Marjorie S.
Finding your passion makes world changing POSSIBLE. You might not be able to change the entire world but you can change a corner of it. Ami's life has been changed because of a couple who see the need for finding orphans a family. Marjorie also helps others navigate through the adoption process. Another passion of mine is a local public school. I truly believe in education even though I don't currently have children. After a big project I did to help out the school, I was quoted in the paper about helping others, "Everyone can do something." A lot of those "somethings" add up. Just find what you can do and anything is POSSIBLE! A chemist, a magician, and a developer all walk into a meeting bringing different skills, but but wearing one common t-shirt. 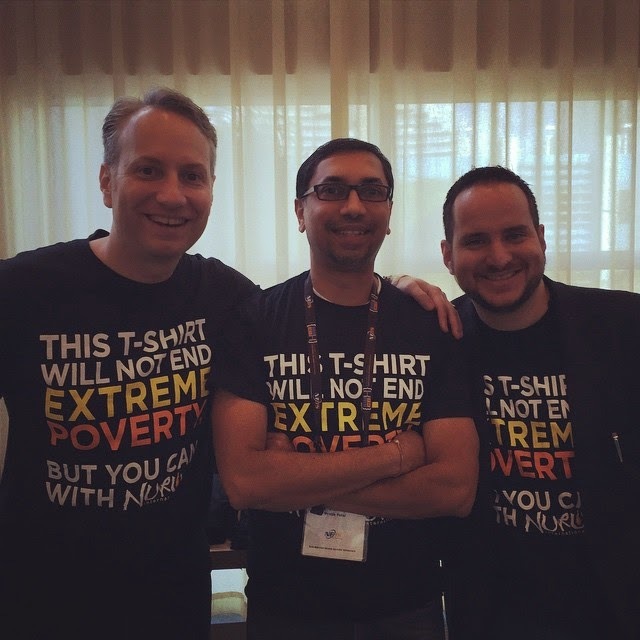 If you can't read it, it says, "This t-shirt will not end extreme poverty, but you can with Nuru". Each time I list something for sale online, I usually donate 10% of the amount to a charity, often times Nuru. I have mentioned Nuru in an interview I have done about how I donate from auction sales. I give, and I spread the word. I might not be able to be on the ground in Africa making a difference, but this is how I make a difference from West Virginia. What do my donations and spreading awareness make POSSIBLE? 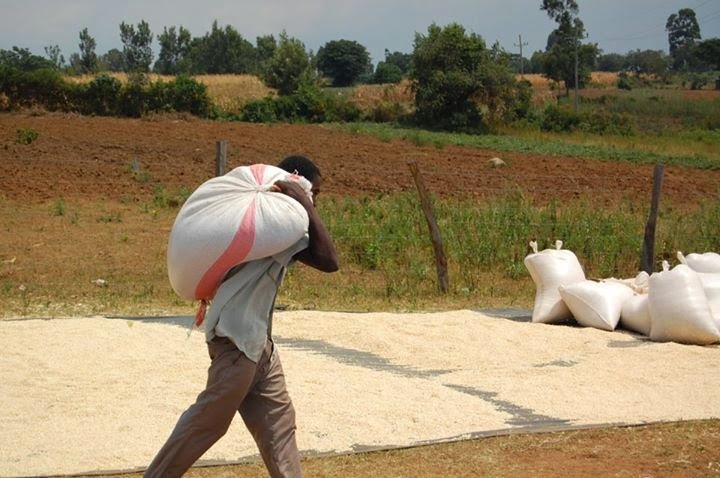 A farmer has more maize than his family needs and he can sell some for a profit. The lady in the photo is making her first deposit in a banking system and was so excited she was able to save some money that she asked for her photo to be taken. Just like Stephan Bauman says in his book, let's find our cause, raise awareness, and change the world because it truly is possible. If I can help change the world, you can too! Find your passion. Hone your skills, and let's see lasting change! Needless to say, I highly recommend the book Possible. This is great for every college student who is dreaming great dreams. I recommend it to pastors, mission boards, those interested in the poor. Basically, if you care about people, I would say you should probably read this book. Believe it or not, this was a book review sponsored by Family Christian. They are a fantastic go to place for all your needs, it doesn't matter if you are having a VBS at your church or the jungle on a mission trip, they have the supplies you would need to make changing your world POSSIBLE. They want to give one reader of this post a $10 Appreciation certificate to Family Christian. This giveaway is open to the USA only and ends April 9. Winner has 48 hours to respond to the winning e-mail or another winner will be chosen. My passion is helping the homeless. Its so important to help someone down on their luck. Just seeing a smile on their faces makes it so worth it. I would probably buy Amish Promises. It looks good.